Labour’s Shadow Home Secretary has rejected suggestions that UK-Israeli relations would suffer if party leader Ed Miliband becomes prime minister in May. She dismissed such claims a bid to “play party politics” with foreign affairs. 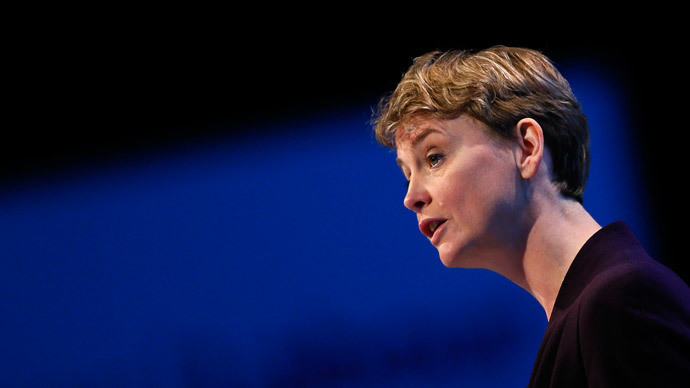 Yvette Cooper’s comments were issued in an exclusive interview with the Jewish Chronicle in response to remarks made by Conservative Northern Irish Secretary Theresa Villiers. Villiers had claimed in January a newly-elected Labour government would have a “chilling” effect on Britain’s relationship with Israel. The Labour chief had also criticized Cameron’s stance on Israel’s actions, accusing the Tory leader of being too ambivalent on the military campaign. While some backbench Labour MPs have signaled support for Britain’s boycott, divestment and sanctions movement (BDS) against Israel, the campaign has not been endorsed by Miliband or Cooper. The British arm of the movement is backed by academics, pro-Palestinian campaigners, and politicians across the UK. Launched in the Occupied Territories in 2005, it is supported by over 170 Palestinian organizations representing exiled Palestinian refugees, Palestinians in the occupied West Bank and Gaza Strip and Palestinian’s who suffer discrimination in Israel. Speaking to the Jewish Chronicle, Cooper said Miliband has made his position on boycotts against Israel clear. “Ed does defend Israel, but that’s not to say he will support every decision the Israeli government takes. No one could expect that,” she added. While addressing the UN in October 2014, world renowned linguist and political commentator Noam Chomsky was somewhat critical about the BDS campaign. He argued it is characterized by a set of tactics rather than principles. “Tactics are not principles. They’re not actions that you undertake no matter what because you think they’re right,” he said. As part of her role in government, Cooper has worked closely with Jewish groups in an effort to tackle racism and hate crimes in the UK. Amid a rising climate of anti-Semitism in Britain, the Shadow Home Secretary said government cuts had led to drop in “community-led policing.” Cooper said the decline of a neighborhood police presence in Britain is problematic. “You need that community-led policing work because people have a right to feel safe on their streets and in their homes,” she added. A poll conducted in late January indicates Israeli foreign policy has not impacted on the majority of Britons’ resolve that Israel has a right to exist. The survey, commissioned by the UK’s All-Party Parliamentary Inquiry into Anti-Semitism, revealed 89 percent of Britons polled said the Middle Eastern state has a right to exist. In the wake of the Charlie Hebdo massacre in Paris, members of the Jewish community in North London’s Stoke Newington told the Shadow Home Secretary they were concerned. Cooper said high-profile terror attacks and anti-Semitic abuse on the street and on social media platforms can seriously impact people’s day-to-day lives. “We should never ignore that. We have to take it seriously and provide that reassurance for people,” she said. The Shadow Home Secretary insisted a newly-elected Labour government would implement measures to counter extremism and the rise of radicalization in Britain. She added a reformed strategy for tackling hate crime in Britain is paramount. Cooper condemned social media firms for failing to intercept online anti-Semitic abuse, stressing how Labour's Lucia Berger MP was exposed to offensive vitriol from an online troll in 2014.